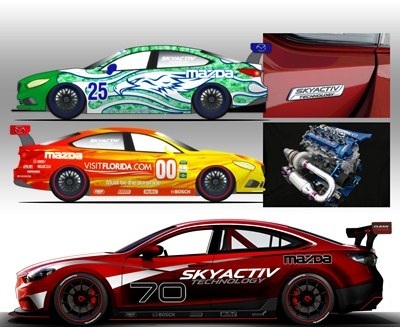 Mazda announced pricing for the all-new 2014 Mazda 6 sedan yesterday, and today announced the diesel version is going racing. Just a few months back Mazda stunned the press and attendees of the Paris Auto Show by announcing the new Skyactiv Diesel engine in the Mazda 6 will achieve up to 60 mpg. EPA ratings are still pending, but if the final version achieves anywhere near that, or even gets 50 mpg highway, the game is going to change in the mid-size sedan marketplace. Low volume engines like the diesel in the new 23014 Mazda 6 face hurdles that the high volume engines do not. One thing that they do not have is the benefit of miles driven. That means there are still some areas for improvement in the design and manufacturing to make the endurance and performance better. Since the days of Henry Ford and horseless wagons manufacturers have used racing programs to stress their machines to see what breaks. They can then translate that knowledge into a solution and make their road-going cars better. Kia has used the Pirelli World Championship series to test and improve its Optima that competes with the Mazda 6 in showrooms. Audi has gone all out with diesels in racing even wining (heck, dominating) the 24 hours of Le Mans. The 2014 Mazda 6 diesel will be on the racetrack tonight, January 4rth, 2013 and all weekend, at the “Roar Before the 24.” This is a preview event to the Rolex 24 Hour Race at Daytona that Mazda is planning to compete in. It will run in the Grand-AM GX class at the race scheduled for January 26th and 27th. No stranger to the race, Mazda has 24 class wins under its belt in other cars in past races. Mazda also expects to have teams run the full race series this year. Mazda is often cited as the most raced brand due mostly to its MX-5 Miata, which is raced in a wide variety of forms.